Does it feel like Fall has arrived where you live? Over here in Southern Ontario, we’re having a second Summer, so it definitely doesn’t quite feel like Fall just yet. That’s why I was so inspired to put together a vintage floral Fall table setting, and I was able to do so VERY inexpensively, too! Now, tablescapes are not my forte. We haven’t entertained much, and I consider myself a pretty terrible hostess – my husband is always the one refilling people’s drinks and such… so this doesn’t come naturally to me, but I would like it to, which is why I’m making a greater effort to try putting together table settings and go out of my comfort zone. I’ll let you be the judge of how well/poorly I’ve done! To start, I used brass candlesticks I already had and milk glass vases I also happened to own. Sometimes shopping your house first is a good idea, because these are things that usually get stashed away and don’t get used all at once like they are here! I picked up some blooms at a local shop (check out The Local Bloom if you’re ever driving through Cobourg, ON), and got the pinecones and faux pumpkins at the dollar store. I also picked up a few extra inexpensive flowers and the real pumpkins at a Farmer’s Market. The table runner is just simple craft paper (which you’ll see again in another tablescape post next week), and I was tempted to draw or write on it, but left it plain and simple. I think the colours and textures on the table speak for themselves! The glasses are vintage, and since I have 2 sets of 4 glasses, they’re mismatched, which I LOVE! The flatware is just my own existing set, and I picked up some inexpensive cotton napkins a few weeks ago – because I never have dinner parties and so didn’t actually own anything but paper napkins, can you believe it? The horror! The plates and bowls I found in one swoop at a local thrift store. They cost me a total of $5 for both sets of 8. I just about squealed when I heard the price, even though my husband will tell you we most definitely did NOT need to hoard more vintage plates into this house! I love that there are oranges, yellows, reds and browns mixed into this tablescape, which are all very typically Fall colours, but the floral motif on the bowls and the hints of pink make Fall a little less obvious. The blanket on the bench is also a thrifted wool piece I found a few years ago, and I normally only use it around Christmas, but it felt oddly appropriate here. Overall, I think I could recreate this for REAL people to come and enjoy, and I just might be tempted to do so more often now that I know I can pull this off in a hurry with a few things I already own and a quick trip to pick up flowers! I also shared a larger Fall home tour earlier this week [here], and you can see that I’m all about keeping it simple with a few cozy textures and warm colours to bring the feeling of Fall inside, so it was super fun to get a little more colourful with this table setting. 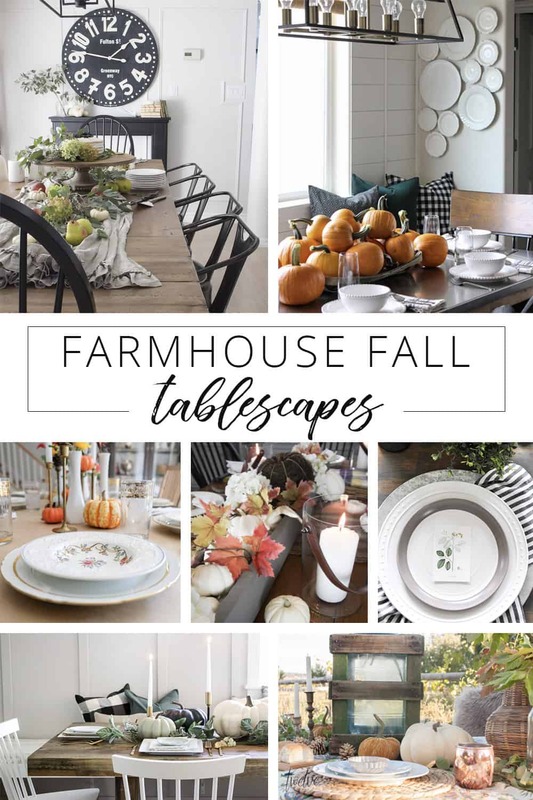 And now you get 6 more beautiful and inspiring Fall tablescapes to look at. How lucky are you? These ladies have put together some truly gorgeous table settings, and you should go check them out and feel inspired! This is so awesome and refreshing! I love the mix of florals with the pumpkins and pinecones! I love your milk glass vases! And those colors, wow! Love it all!